Supplied by SW Piano Movers. Protect all floor types and easily move and clean behind the piano. £19.65 including 1st class postage within the UK. Have your piano castor cups fitted when we deliver your piano. We can also visit you in South London to fit them to a piano already in place. you can buy your gliding castor cups through our ebay listing for you to fit yourself. ebay is a safe and secure platform, which offers you buyer protection. The cups will be dispatched by first class mail within 1 day, and UK postage is free. My instructions for the safe installation of the castors under your piano are included. Shipping within the UK is free. For Europe and N.America, add a £3.50 flatrate shipping charge. ebay will inform you of shipping charges to Australia and NZ. Piano castor cups with a difference! 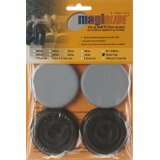 These modern PTFE sliding cups are suitable for pianos with castors up to 60mm in diameter with a maximum width of 30mm. A good set of castor cups can protect your cherished floors and carpets, but once in place, a piano can sit for years gathering dust behind, beside and underneath it. Sliding castor cups allow you to move a piano either away from the wall so you can clean behind it, or even further across a room, without the need for lifting. The castors sit snugly inside the concentric rubber rings, and are gripped so firmly that the slides allow the piano to be moved without the cups tipping over... and the casters contacting the floor. The sliding cups are suitable for all surfaces, wooden, tile and carpet, and are made of the highest quality components, and can support the weight of the heaviest upright piano with ease. I use these cups myself and recommend you consider investing in a set when we move your piano. If you let me know when you are booking us, we can ensure we have stocks on the van. Take a moment to consider your floors and how to move your piano. 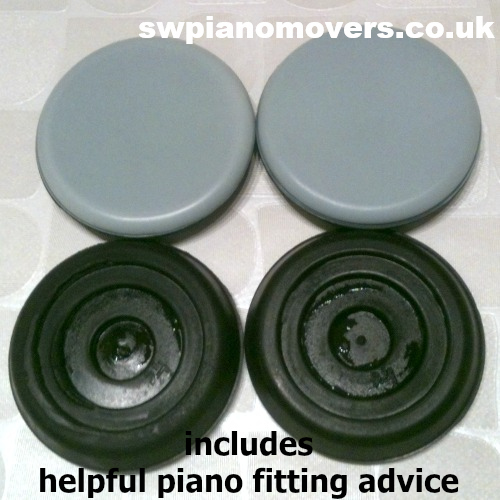 Our price to supply 1 Pack x 4 sliding castor cups when moving your piano. See also: We supply and if necessary fit a range of piano accessories, spares and internal moving solutions. Two people are necessary because the first thing you need to do is to each stand at opposite ends of the piano, with a hand each between the top left and right corners of the lid and the wall. Slide the piano one end at a time, little by little, away from the wall, noting that when one end comes out the other end will try to move into the wall, stopped by your hand pulling it away. Good service? - Please come back and click this facebook 'recommend' button - or the 'G+1' button below. Thank you very much!